Nikki Donovan has enough trouble fitting in at her new school without the weird guy who keeps following her around. And when he approaches her, claiming to be sent by her long-lost father, Nikki finds out the truth: the father she never knew is the demon king of the Shadowlands- the realm between our world and the Underworld-and now that he's dying, she is his sole heir to the throne. Maybe it's because she's in shock, or maybe it's because the messenger, Michael, is actually kind of cute, but Nikki follows him into the Shadowlands. There, she learns about her half-demon powers, about the potential war between the Shadowlands and the Underworld, and that her father wants her to assume the throne-forever. Not to mention that her growing crush on Michael is completely forbidden-he's a Shadow creature and destined to be her slave. 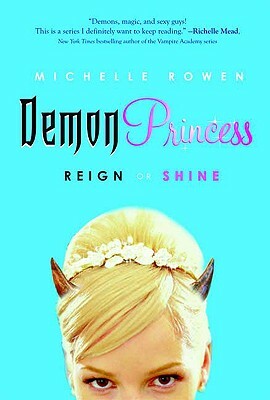 What's a teenage demon princess to do?